The Roth family are having some fun with the brand new Van Halen release. Rockabye Baby! is a music line that turns rock songs into lullabyes. The series includes collections made from the songs of artists like AC/DC, Metallica, Aerosmith, Pearl Jam, The Beatles and many others. "First and foremost, we're fans,” says VP Lisa Roth. “So we take care to make every album musically interesting enough to satisfy adult listeners. Believe me, making an album that's gentle enough for sleeping babies but won't bore Mom and Dad is trickier than it sounds." This week, Roth and company have issued “Lullaby Renditions Of Van Halen,” a collection of tunes by the hard rock legends – ready for the youngest audience available. Kids have an unchained energy; they erupt and jump – or run like little devils. There’s no better soundtrack to this than the unbridled, fist-pumping music of Van Halen. But when the playdate’s over and it’s time for your diminutive Diamond Daves to settle down, VH’s thunderous rhythms and wailing guitars are not the soothing sounds to sway your little one to sleep. Leave it to Rockabye Baby to find a way to turn these songs into lullabies with Rockabye Baby! 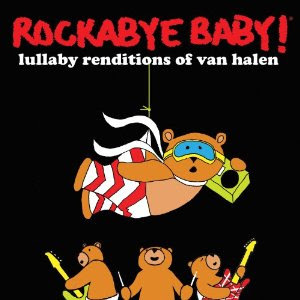 Lullaby Renditions of Van Halen. Lisa connected with brother David Lee to help tune in fans to the new tunes…see the video below.